Sturdy pot and frame for climbing plants. Strong, durable plastic with a gold painted effect. Perfect for sweet peas, clematis and more. Pot holds over 20L compost. This is the perfect solution for growing tall climbers easily year after year, in a stylish yet sturdy planter system, with matching trellis. The Tower Pot is made of tough durable plastic, with a gold-painted effect. When fully assembled, the reaches 1.3m (4ft 4in), tall, and at 37cm (15in) diameter, the pot holds over 20 litres of compost, giving a large root growing volume. Perfect for annuals like sweet peas, nasturtiums and morning glory, or perhaps climbing petunias, or geraniums, the Tower Pot system shows all your climbing plants off to their best effect - try it with one of our patio Boulevard (R) clematis! Height:1.3m (4ft 4in), Diameter 37cm (15in), Volume: Over 20 litres. 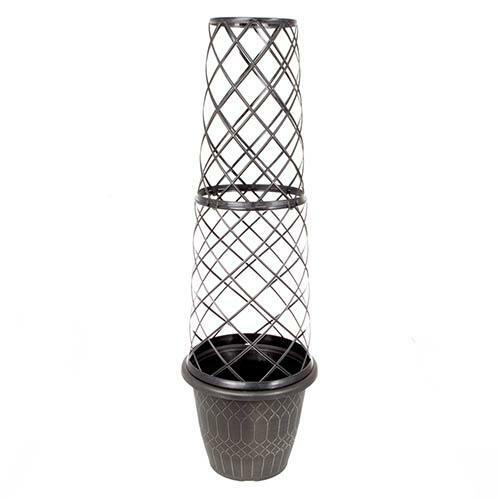 Supplied in 3 parts including pot, and two part frame which easily connects together, the Tower Pot is made of tough durable plastic, with a gold painted effect.